Man, nature, territory. 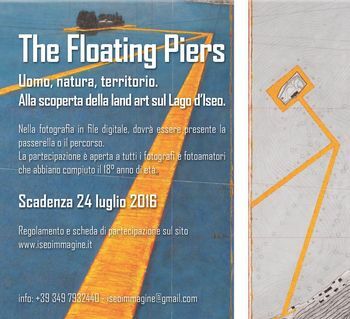 Discovering land art on Iseo lake. First prize: €300 + 2 nights for 2 persons in hotel with breakfast. Second prize: €200 + 2 nights for 2 persons in hotel with breakfast. Third Prize: 100 €+2 nights for 2 persons in hotel with breakfast. The exhibition of the winning photographs will be held at the Tourist Office in Peschiera, Monteisola from 27th August until 11th September 2016. Image requirements: JPG High resolution format. aesthetics the theme of the completion. Submission of digital photos by email.